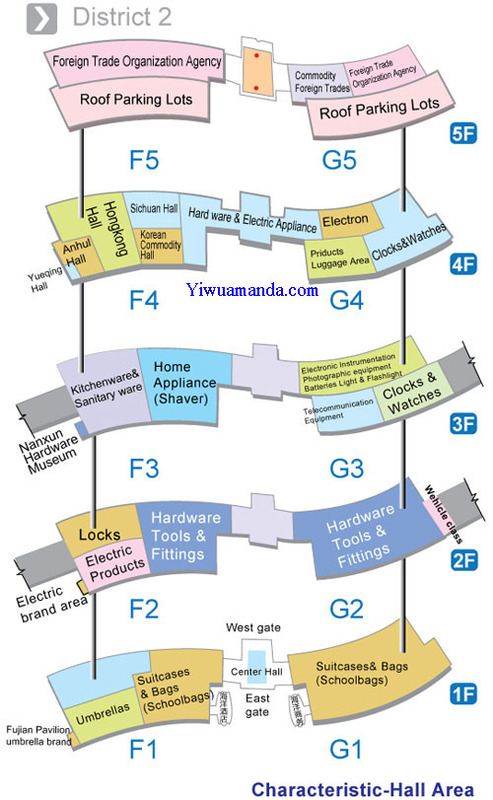 Opened on 22 October, 2004, Yiwu International Trade City District 2 (Section F & G) occupies 483 Mu, over 600,000 m2 building area, above 8000 booths and the business entities exceed 10,000. The first floor deals in suitcases & bags, umbrellas and raincoat; the second floor deals in hardware tools & fittings, electrical products, locks and vehicles; the third floor deals in kitchenware & sanitary ware, small home appliances,telecom facilities, electronic instruments & equipments, watches & clocks etc; the fourth floor is manufacturer outlet center and other high-class business area such as HK Hall, Korea Hall, Sichuan Hall etc; on the fifth floor, there is sourcing & service center of foreign trade; on floor 2-3 of the central hall, there are tourism & shopping center and Historical Museum of China Commodity City. There are supporting facilities, including industrial & commercial bureau, tax bureau, local police station, banks, restaurants, logistics, post office, telecom companies and other functional departments and service organizations, in the east subsidiary building. And the market has business building, office building, four-star hotel, east and west square as well as sightseeing bus around the market. In 2005, the China Yiwu International Trade City District 2 ISO9001 quality management system certification, ISO14001 environmental management system certification and the assessment of national AAAA Tourist Attraction. The main products list show in Yiwu International Trade City District 2: Hardware and electric appliance, Electric, Luggage, Clocks & Watches, Hardware Tools & Fittings, Home Appliance(Shaver), Electronicdevice, Photographic supplies, Battery flashlight,Telecommunication equiment, Clocks & watches, Lockset, Electric Products, Hardware Tools & Fittings, Vehicle,Raincoat & Umbrellas,Suitcases & Bags(Schoolbags, Poly Bags) etc.